It's National Library Week in the US, which got LT staff to talking about all our favorite libraries, and how much we love them. We made a blog post about our favorites here. What are your favorite libraries? Some beautiful images in those lists! I don't get around much, so my favourite is just our local one because ... it's there. Amazing views and really nice architecture as well, nice to just sit on a couch reading the Staff Picks and watching the waves come in from the Pacific. Montgomery County Public Library system in Maryland. I see they now have 23 locations. When we lived there in the 80's, every trip to the library was a celebration. Loads of cool displays, great children's rooms, lots of multicultural events, more books than you could ever desire. Once, when the scanning system went down, librarians just counted the number of items still going out the door, instead of limiting checkouts. And most people normally checked out armfuls of materials at every visit. My job as a real estate appraiser gave me the opportunity to stop by each of the branches; and they each specialized in a particular collection, as well as the general materials common to all. So, Gaithersburg held a ton of materials from architecture to crafts; I think Twinbrook specialized in the sciences, etc. All available through ILL system too, but very impressive for research purposes to be able to go to one spot and browse. University of Tasmania Morris Miller Library A welcome place of study and exploration during my semester abroad. Newport Public Library My childhood library. I used to love hunting their packed shelves for my next great read, often carrying stacks of books to the counter, asking them how many I could take home with me. Beinecke Library Bucket list library! Trinity College Library Another bucket list library, absolutely gorgeous. Tie between America's Test Kitchen and American Cheese Society Libraries centered around food. Need I say more? University of Chicago Joseph Regenstein Library. - First library that hired me. Six Mile Regional Library District Branch. - Baby's first library! Choral library at Rockefeller Memorial Chapel - This one bears a little explaining: I got to work in here as part of my student job as a Choral Office Assistant. Didn't have room for it in the blog post, but here's a picture! Seattle Public Library - My current library system's flagship. I pick up my books at a more local branch, but I'm here often enough for events! Tuscaloosa Public Library - They've been great to my grandparents, and to me over the years! The Library of Congress - I used to live on the Hill and would go there to read books that weren't available at Borders. It still strikes me as being exactly correct- grand columns and gilding overshadowed by the quest to preserve as much knowledge as it can. The Joanina library at the University of Coimbra, Portugal- Beautiful in a 'preserved in amber' kind of way. All those cramped, thrown together libraries I grew up in in US outposts all over the world. God I loved those places. >9 SomeGuyInVirginia: All those cramped, thrown together libraries I grew up in in US outposts all over the world. God I loved those places. That's a fine description of my experience with DoD libraries around the country and in Germany. I have few specific memories (a trailer, a house on concrete blocks in Texas) so it applies mostly to my overall experience. I was blown away when I visited the 5th Ave. branch of the NYC library. I also loved the cozy little public library a few hours north in Sleepy Hollow. I'm going to brag about my favorite local library in Glendale, AZ. 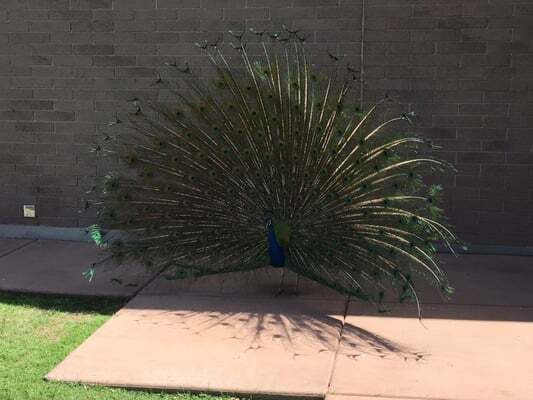 It's the main branch that has a desert botanical garden, many sculptures on the property, an installation of giant copper trees, a small performance hall, and best of all, a large flock of peacocks that live on the grounds. Around two dozen, they walk the grounds, sit on the roof over the entrance watching the goings, call to each other incessantly, and often display their plumage to tell people that this is their space. A.K Smiley library in Redlands, CA is the most beautiful public library I've personally visited. Gorgeous old building with wood floors, stained glass windows, and a fireplace I don't think they use. It was just a wonderful environment. The tiny nearby Mentone library holds a special place for me too, though it couldn't have been more different from Smiley. At the time I was visiting frequently they were located in two tiny patched-together storefronts, with a winding back hallway leading to their bookstore room, and shelves tucked wherever they fit in the most idiosyncratic way. They later moved to a newer, larger location, but when I think of my time there that's what I see. I used these two as a teenager. I don't remember my childhood library too well, though I do remember the card: it was bright yellow with black text, and a white signature strip, and I got it as soon as I was able to write my name small enough to fit and be legible on the strip. I wish I still had the card, but it got lost somewhere after we moved to a different county. Trinity College Library is gorgeous! I was fortunate enough to be able to visit there when I was in Dublin a few years ago, and it's well worth the trip. And, oh, >11 mstrust:! Peacocks? How wonderful! We mostly get pigeons. I must put in a word for my local library, the Blackstone Branch of the Chicago Public Library. It is the oldest branch library in the city, designed by Solon Beman (who, not coincidentally, also designed a Blackstone Library in Connecticut - the same family gave the funds for each). It has gorgeous murals, recently restored, by Oliver Dennett Grover. Agree with >3 ablachly: about the Boston Public Library. I had been there quite a few years ago, but re-visited it earlier this year. They've done a nice job with the new addition, but I will always have a soft spot for the John Singer Sargent murals and that stunning reading room. >8 lorannen: Have you been to the Mansueto Library next to the Regenstein? It has very cool robots to retrieve the books. And the, of course, there's the Biblioteca Nazionale Marciana in Venice, because how can you not love a library decorated by Veronese and Tintoretto? Oh! Speaking of Venice, the Cini Foundation libraries! >11 mstrust: What lovely mascots Glendale has! >13 lilithcat: Oh yes! I was still on staff when Mansueto opened. It was very exciting and neat to watch. I've been down below, where the books and robots live. Collection-wise, it provided much-needed relief to our literally overflowing shelves. Due to its shape, we dubbed it the "Reg Egg." As interesting as it was, the interior isn't my cup of tea, design-wise. A little too Ikea, sitting at the long row tables to work or study made me feel like I was in a cafeteria. I grew up with Montgomery County Public Libraries! I used Gaithersburg when I lived in Montgomery Village, and Twinbrook was my childhood library (the old Twinbrook Library though, probably not the one you know-- it moved across to the other side of Viers Mill Rd around 1975). - The Folger Shakespeare Library, Washington DC. I find it interesting and not altogether surprising that three of these are in a place I have avoided to the best of my ability since I moved (just an hour) away. I also do need to shout out to Portland Public Library's main branch: I don't spend much time there, but the librarians are stellar, and they do so much great work in and with the community. Do school libraries count? Because my very, very favorite library would have to be my elementary school library, at Holmes Elementary in San Diego, CA. Granted, I haven't been in that library in fifteen years, but it was my haven. Back before computers did everything, I remember looking things up in the card catalogue, and the librarian (and I can not remember her name!) was just the sweetest. They had such a varied selection, everything from the popular series of the 90s to the weird titles that no one had ever heard of. That was where my love for reading blossomed, sitting at those little tables pouring over books. Can't believe I forgot the Newberry Library! I love this place! Unlike a lot of research libraries, here the only requirement for getting a reader's card is to be "at least 14 years old or in the ninth grade" and have "a research interest that is supported by the Newberry’s collections" (which is pretty much everything, and is loosely interpreted). They also have a ton of public programming (classes, lectures, etc. ), not to mention an awesome book sale every summer. Are you from Tuscaloosa? I live here, and the Tuscaloosa Public Library is good, but so crowded because the city has grown so much and the town just won't fund additional branch libraries. This library is also home to the world's largest collection of papers and ephemera about the Troubles. It is my dream to go to Belfast and work in that library. I am a collector of Presidential Libraries in the U. S. The Presidential libraries in the U. S. are wonderful places, regardless of the politics of each person. I have been to the following Presidential libraries and hope to visit several more of them in the coming years. I have plans to visit the Franklin Roosevelt Library in Hyde Park, New York this summer. The Lincoln Library is somewhat controversial. It is not an official U. S. government repository for Presidential papers, because there was no system for the deposit of a president's papers when he died. Lincoln's papers are in the U. S. National Archives in Washington, D. C. The current library in Springfield is very new, and was started by a foundation of people who thought that Lincoln was important enough that he should have a library. They raise money and purchase materials of Lincoln as they come on the private market. The Eisenhower Library is a beautiful limestone building that is big, square, and unpretentious. Just like the man. It is also the burial place of Ike, his wife, and infant son. The Kennedy Library is an impressive piece of architecture with an impressive setting in the landscape. (I. M Pei designed it.) It looks out over the waters of the Atlantic Ocean, and you can easily picture Kennedy sailing on the waters of the Bay. However, the most impressive architecturally is the Clinton Library in Little Rock. It is a gem. It was designed by James Polshek who was a student of I. M. Pei. >20 benitastrnad: I'm not, but my grandparents have lived there for years, so I'm a frequent visitor. Your assessment of the situation is in line with what I've heard from them. We tend to go there during off hours, so I don't notice the crowdedness as much, myself. I've long wondered why there weren't more branches—it's not like there's a moratorium on building new things in town, especially in recent years! I'll say this for the staff of the main branch, though—no matter how busy they must be, they've always been kind and helpful to me and my Grandad when we visit. I'm glad to know that so many great libraries are still being loved and appreciated. I hear a lot lately about funding cuts and closing branches. Check out this interesting link to the 19 most beautiful libraries in the U.S! 1. My family's personal library. I grew up thinking a family library in the thousands, with a real intent to cover most topics, was entirely normal. 2. Boston Athenaeum. Growing up, one of my best friend's was the son of the director, so I spent a lot of time there, and he could take anything out. I particularly remember the day we spent finding all the very oldest and coolest books on magic and witchcraft they had. 3. The Library of Congress. I went to Georgetown, but apart from the Woodstock Theological Library in the basement, it was only so-so and needed more. The LC—arguably the greatest library in the world—was my library and, really, my university too. 3. The Boston Public Library. The BPL is, with the NYPL, one of only a few publics that try to maintain a serious research collection. I did a lot of work there in High School (I was a weird kid okay?). The main reading room is my idea of Heaven. 4. Beinecke Library. Architecturally, the most gorgeous library I know. I took my son to Yale just to see the library, and it was closed! But I recently made a replica for him in Minecraft. 5. University of Michigan Classics Department Library. Most of the Classics grad programs I know have such a library—Yale has a decent one and Harvard's is fantastic. The point is to put almost all the texts you'd ever need, and many of the key secondary sources, in a single room. You can do it for Classics, anyway, and it's a wonderful thing. 6. Center for Hellenic Studies. Somehow I got access. Great library, wonderful location. . Fake library: I think about Borges infinite library WAY more than I should. I always wanted to see the Library of Alexandria. I wonder how much we lost. The Poetry Foundation's library is pretty nice. This thread is very timely. The American Library Association (ALA) just released the annual list of the AIA/ALA Library Building Awards for 2017. (AIA = American Institute of Architects) You can see the libraries that won the awards at this URL. Boston Public won several of the awards. Good going Boston! >29 benitastrnad: Very cool! Thanks for sharing! I have never been to the library at Brandenburg Technical University in Cottbus, Germany, but the design is certainly intriguing. This is another of the libraries that I plan on visiting someday. The descriptions call the design amoeba like, but I think it looks like a medieval castle. I love libraries! and I love all the unique designs for them. Some of the modern ones, like the the National Library of France, that goes so high into the air, and the British National Library that chose to go underground, are fascinating from an architectural point-of-view. Here is a URL for an article in the New York Times about the Bibliotheque Nationale de France. Here is a quote from the article about the design of the Bibliotheque Nationale de France. "Often mocked as pharaonic or Ozymandian, the library - like the pyramids or the gigantic stone head in Shelley's poem - seems to be a building that is both wonderful in its way and also strangely out of its time. Rising alongside the Seine, its four towers, which are shaped like open books, have already become a familiar Parisian landmark, particularly at night when the warmly lit towers resemble skyscraper-sized bookshelves." Here is a URL for an article in the Guardian about the British National Library. Here is a quote about the design of the British National Library from that article. "Wilson's designs were criticised by hi-tech architects for being namby-pamby, reviled by traditionalists for lacking power and glory, and jeered at by the Prince of Wales for resembling an academy for secret police." I saw that last year in the edition of American Libraries that features the award winners. Great library. Makes you want to go in and see what they have. Beyond that, I don't pay attention to architecture and such. The library is good if it carries books I enjoy reading. It lacks in good books, it doesn't rate. * Tewksbury Public Library (Tewksbury MA) - because it's my hometown library and the former library director, Mrs. DeMaris, did such a great job in expanding the size and capabilities of the library. * Adams County Public Library (Gettysburg PA) - I used to live here and the library is in the majestic old courthouse and it's open on all kinds of holidays when people are off from work and school which is such a wonderful service to offer. >39 belleek: Libraries with fireplaces to read in front of are the dream—at least for me. That sounds lovely. Andrew Carnegie built one of his libraries in Parkersburg, WV. When the community outgrew it and built something modern on another campus, one of our leading citizens eventually acquired it and it became the Tran-Allegheny Book Store. Mr. Saycash died in 2010 and his family lost no time emptying the building and closing the store. Driving by it the other day, I reflected on how the exterior didn't even come close to reflecting the beauty of the insides. When my girls were younger, one of our things to do for fun was to go hang out at this bookstore. There are a few photos of the inside here. Wood paneled walls, grand fireplaces in each room, the front balcony space large enough to house a symphony orchestra, the wonderful stained glass windows, including a skylight directly above the spiral stairs. Yes, those are slab glass floors in the stacks. Eventually, there was nothing further I wanted to buy. The stock never seemed to change after a while, so I visited less often. But now and then, the building itself would pull me back for another appreciative visit. Before the advent of internet search and purchase, Mr. S. managed to find a set of Book Trails for me. Some of my favorite books still have the atmosphere of this place clinging to them. Yes, love the Newberry and don't get there enough. >41 2wonderY: You know, that's cool. >39 belleek: At Nevins Memorial Library We have two fireplaces, and during the winter everybody loves it in there. (And there are very few tables and places where people will be talking, so it's a relatively quiet room to read in front of the fire too!) I think it's also really cool, because it's one of the Suburban libraries that wasn't a Carnegie, or that didn't start its life as something else like a town hall or a school or a mansion or whatever. It's definitely one of my favorite libraries, but, my childhood library, Reading Public Library will always edge it out Nevins by just a bit. I thought that it was awesome before the end of last year, and then they redid the whole place. It could have come out being worse than before, but, they took what had been very obviously a school that had been turned into a library, and made it into a library that's a library. The "Old" library on bluff above Corpus Christi, TX was in a big, old home with white pillars. Children's section up a lovely staircase at the front of second floor with huge windows open to breeze off the bay. Mine...Brooklyn (NY) Public Library, Boro Park Branch. It's where this passion began. Most recently: York County (PA) Library System, Dillsburg Branch. Couldn't live without a Library. The Main Library at the University of Illinois Urbana-Champaign is near and dear to my heart. I worked in the "stacks" throughout my undergrad days and various other departments throughout my undergrad days. Sadly, when I was there 30 years ago, the Reading Room had not been restored yet. It's pretty amazing now. I'm also completely in love with a library that is yet to be - Rocky Mountain Land Library. I first learned about this library via the NYTimes article. A library dedicated to my favorite topics, on the range in Colorado - HEAVEN. Last but not least, the volunteer run library at my son's public school in Chicago. Of course, there's no money for a librarian or books, but after a few years of neglect, a small group of teachers and parents worked together to re-create a functional library. It's a work in progress, but the primary grades have been using it regularly. Books in hands - that's what it's about! I'll always remember the public library in Atlanta, IL. Every summer my family drove from our home in Oklahoma to my grandparents' house in suburban Cleveland. On the way home in 1967, our car lost its axle on the highway. We were towed to Atlanta, which had one main street with the garage, a diner, and nothing else that I remember. It was August, and nothing was air conditioned, and dust was everywhere. Neither of my parents were happy campers, and my infant sister was taking all their attention. Finally, my mom said 'Let's walk up to the library'. There it was, a small Carnegie building like a castle at the end of the main street! We went in, and my mother explained to the librarian why we were spending all day in town, and that she normally wouldn't leave an 11 year old alone in a strange library, but I was really well behaved, and could I stay there until our car was fixed? The librarian was very gracious, and showed me the children's section. I spent all afternoon reading Little House books and was sad when I had to leave. Librarians are very nice, aren't they? On looking for an image of the library, I did find that the building is not a Carnegie library. It was community-funded, which is pretty cool, and it is still a library. Cooler still, it's on Route 66, and Atlanta is also the home of the J.H. Hawes Grain Elevator Museum (which has never been open when I've had occasion to drive by Atlanta). The tiny community library where I grew up is definitely still my favourite. It didn't have much in it, but it was well taken care of, incredibly well organized and easy to browse through, and the ladies that volunteered there were always friendly and helpful. Not to mention it was right near the school, so I could go there whenever I wanted (at least once a week, I was a fast reader)! I must have read the entire teen's book section, fiction and nonfiction, by the time I started high school, I was there so much. Plus the events - movie nights, local book signings, and weekly "storytime" for families with young kids, which I got to help out with a couple times. I've been to other, bigger libraries since then, but somehow I can never enjoy them quite as much as I did there as a kid. Too many fond memories. Any library is a favorite of mine! I love them all. During National Library Week, I was honored to be the guest author on two community college campuses in North Mississippi. I spoke to the faculty and students at Northeast Community College Tuesday, April 11th. We had a wonderful time discussing my research and the influence that libraries have had on me since childhood. The following day, I visited Itawamba Community College Library where I spoke to an audience of 102 faculty and students! Such a great day sharing fun ghost stories and memories of my time here as a student. School libraries are such an important part of my past education because they build the foundations necessary for a lifelong journey of reading and learning. The Decatur, Alabama public library is one I remember with great fondness. In the summer, my mom would drop me off while she shopped and it was like coming home. The library was located in an old church building tucked away on a side street and has since moved to a modern structure on the highway. I remember checking out Gone With the Wind when I was 13. I have received more of an education from my personal reading than I ever have with school. Do you still live in Decatur? Or Alabama? I drive right past Decatur many times each year on my way back and forth to Tuscaloosa. One of the graduate students who worked for me lives in Decatur and I have visited her several times. >57 benitastrnad: No, I moved to Tennessee in 1974 and my family is not there anymore. My husband's family is in Athens and his 50th high school class reunion is this weekend. Decatur is a nice town. Went to college in Tuscaloosa in the early 1970's. RTR! Check out this article on the World Arctic Archive on the Doomsday Library. 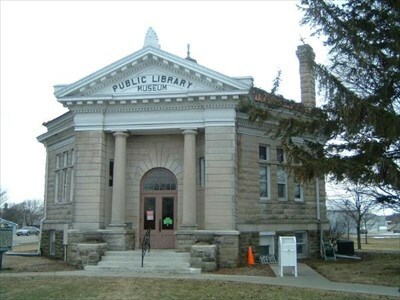 Churubusco Public Library and Allen County Public Library in Indiana.